Stewarded by some of the most conservative justices in its history, and making a mockery of accusations that it contains a liberal, activist agenda, the good ship "Supreme Court" continued its relentless rightward tack this past term. It entrenched Rehnquist-era notions of limited rights and remedies; set the stage for the further obliteration of Warren-era doctrines and practices; and reminded politicians of all stripes that it alone among the current branches of government hews Republican rather than Democrat. With only a few exceptions, the Court ruled against employees to the benefit of employers, against environmentalists to the gain of polluters, and against suspects in favor of law enforcement officials. The self-proclaimed "umpire" on the Court, Chief Justice John G. Roberts, Jr., continued his unseemly pattern – first identified by writer Jeffrey Toobin – of calling only balls for one team and only strikes for another. Justice Clarence Thomas shed any pretense of moderation and Justice Anthony M. Kennedy, the Court's swing vote, demonstrated over and over again that he's a centrist only in relation to his conservative colleagues. And even when so-called "liberal" causes earned a precious five votes on the Court – like when a heinous strip search of a young girl for Ibuprofen was deemed unconstitutional – the Justices managed to limit the damage to offenders, ruling that the school officials who conducted the search were immune from liability. The same pattern held true in the big test over the Voting Rights Act. The Justices narrowly saved the statute – for now anyway – but still ruled in favor of a political district that had sought to get out from under federal oversight. And speaking of "activism," the Court's conservative majority struck down decades-old precedent that had protected the rights of suspects from further interrogation once they had asked for an attorney. Opponents of this brand of jurisprudence ought to realize that things are not about to change anytime soon. The anticipated substitution of 2nd U.S. Circuit Court of Appeals Judge Sonia Sotomayor for outgoing Justice David H. Souter almost certainly will not change the ideological balance on the Court. In fact, as some legal scholars have noted, it is quite likely that Sotomayor will vote to the rightof Souter in many cases, especially those involving Fourth Amendment rights. We will, therefore, see many of the same 5-4 rulings next term that we saw this term with Justice Kennedy determining the outcome. Same as it ever was. If the exception proves the rule, the Court this past term offered a few bright lights for the disenfranchised or needy, especially in the area of federal regulation. The Justices allowed consumers to use state law to sue drug companies despite the presence of guidelines under the Food and Drug Administration. The Court allowed smokers to use state law to sue tobacco companies for false marketing of "light" cigarettes. Justices Antonin Scalia, Samuel A. Alito, Jr. and the Chief Justice dissented in both of those cases. And it stood up to strike down a state judge's attempt to keep himself on a case in which he had received millions of dollars in campaign contributions from one of the litigants. Not that it needs to, but the Supreme Court has not reached a 50 percent approval rating in national polling in quite some time. And this phenomenon is not likely to change even if (or when) Judge Sotomayor replaces Justice Souter and the Court begins to look more like the rest of America. The sad fact is that a great majority of Americans have no real clue about how the Justices reach their decisions, how they should reach their decisions, or why they rule the way they rule. Compared with the Congress, the Court is a big hit. But compared with the Congress virtually anything this side of Bernard Madoff is a big hit. Nothing the Court did this past term, and nothing it is likely to do in the coming term, is likely to change this dynamic. The Supreme Court proved again in its 2009-2010 that its partisan divides are firmly entrenched. Gone is the Chief Justice's early fantasy of more unanimous rulings in more diverse cases. Gone is the illusion, often recited like a mantra at confirmation hearings, that the Justices will necessarily respect precedent and revere consensus. We should stop fooling ourselves into thinking that things will be different. Andrew Cohen is CBS News' Chief Legal Analyst and Legal Editor. CourtWatch is his new blog with analysis and commentary on breaking legal news and events. 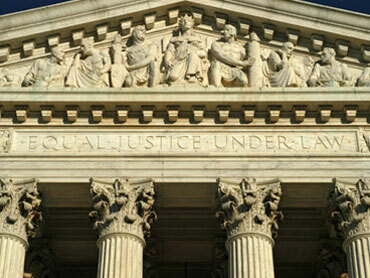 For columns on legal issues before the beginning of this blog, click here.